A time for old and a time for new. That’s the theme for today’s post – featuring some older classic products as well as some of our newest products! 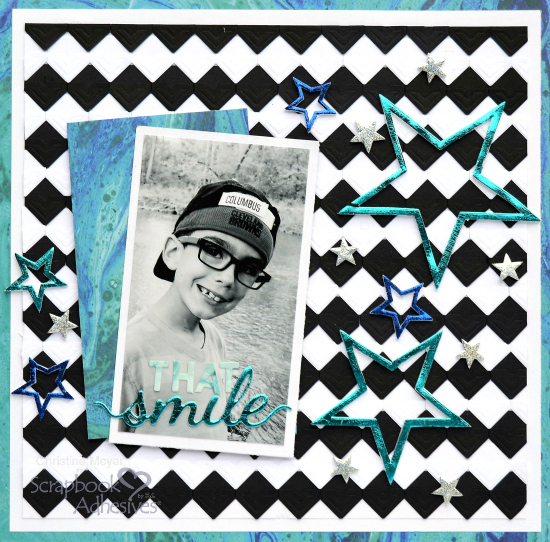 Christine joining you today to show you how I made the class Creative Photo Corners pair perfectly with our new foils for a one of a kind Scrapbook Layout! 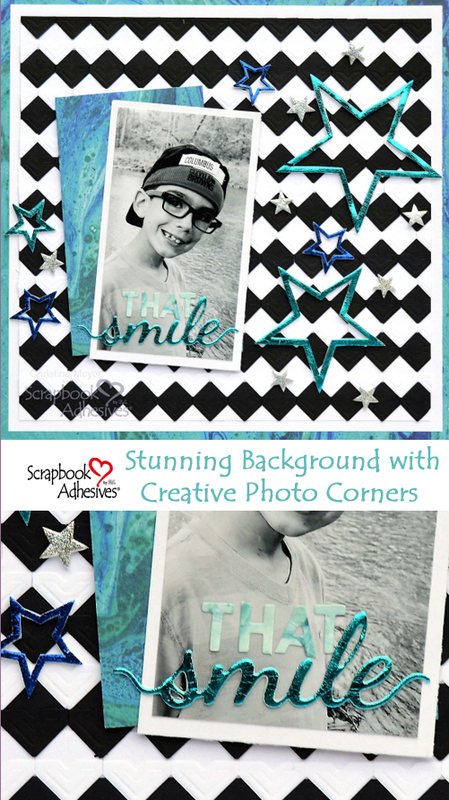 But what really stands out is that this scrapbook layout has a Creative Photo Corner Background. This is a clean style layout but the background is anything but simple! The entire black and white background that you see is made up of Creative Photo Corners. This was somewhat tedious but definitely not difficult! It just required me to take my time to line things up! All you really need to make it happen though is a ruler and a lot of the Creative Photo Corners! Because of the complexity of the background, it was very important that I keep the embellishing simple so that the picture still stood out! I opted for just some letter stickers, one sheet of patterned paper, and some 3D Foam Products. 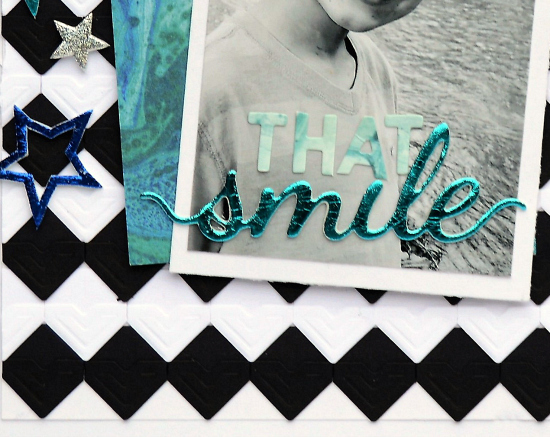 I created the word smile with my metal die cut machine, a “smile” die, and the 3D Foam Creative Sheets! Finally, let’s take a look at those stars and all the gorgeous Metallic Transfer Foils Variety and Metallic Transfer Foils Holographic packs! With so many new foils to choose from, you can really make your layouts shine! 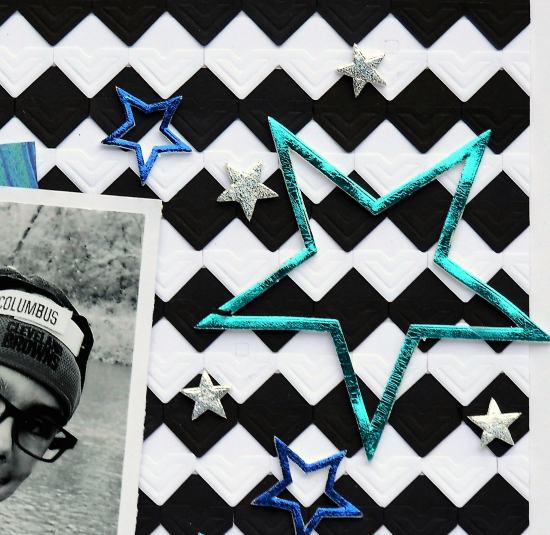 I decorated all the 3D Foam Stars with foils and it couldn’t have been easier. Simply add the 3D Foam Stars, then peel off the top and set the foil on (the pretty side facing up). You just rub the foil a little and it sticks right to the 3D Foam Products. No extra machines needed! 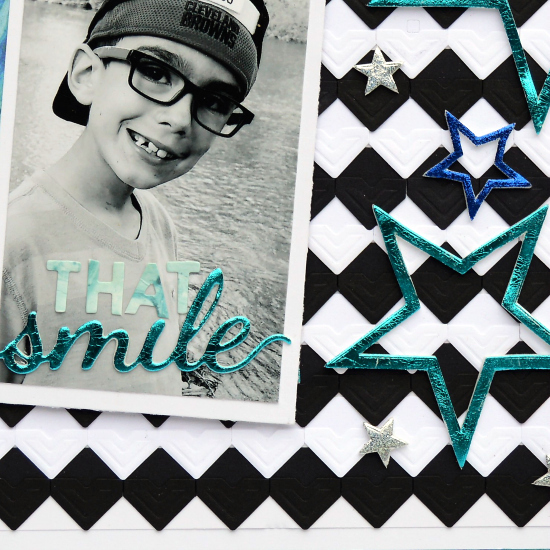 Thanks for joining me today, I hope I’ve challenged you to think outside the box on things to do on a Scrapbook Layout with Creative Photo Corners! This entry was posted in 3D Foam Shapes, Adhesives, Crafts & Tutorials, Crafty Foam Tape, Creative Photo Corners, Intermediate, Permanent Adhesive, Scrapbook Page, Scrapbooking, Skill Level, Wear your Adhesive on the Outside and tagged 3D Foam Creative Sheets Mix, 3D Foam Stars, Christine Meyer, Crafty Foam Tape White, Creative Photo Corners Black, Creative Photo Corners White, E-Z Runner Grand Dispenser, Metallic Transfer Foil Holographic, Metallic Transfer Foil Variety, Paper House Productions, Scrapbook, Scrapbook Page, Tutorial, Wear Your Adhesive on the Outside. Bookmark the permalink.